In this webinar, Oct 25, find out why it's so hard to choose an AI vendor and show you what to consider as you seek a partner in AI. Additionally, get the details of how successfully implemented AI technologies at Wellen have transformed the way the company does business. You want to invest in artificial intelligence (AI) and machine learning to take advantage of the wealth of available data at your fingertips. You know you're going to need help. But rapid change, vendor churn, hype, and jargon make it hard to choose an AI vendor. 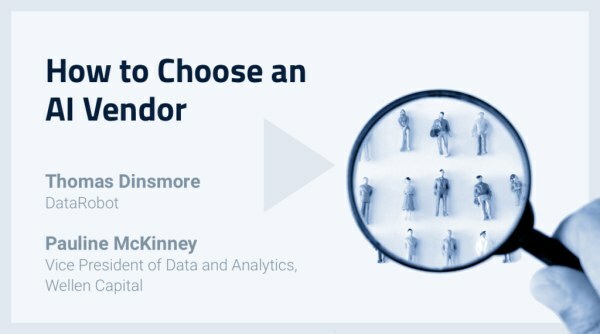 In this webinar, Thomas Dinsmore of DataRobot will explain why it's so hard to choose an AI vendor and show you what to consider as you seek a partner in AI. Additionally, Pauline McKinney, Vice President of Data and Analytics at Wellen Capital, will share the details of how she successfully implemented AI technologies at Wellen to transform the way the company does business.